BANGKOK, 25th June 2018 (NNT) – Online websites have ranked Thailand one of the countries with the least unemployment, the Labour Ministry reports. The Department of Employment's (DOE) Director-General, Anurak Tossara, said today the authorities are seeking a solution to the problem of unemployment among newly graduated students. He said a recent survey by Trading Economics.com and Index mundi.com on global employment status, listed Thailand 4th among countries with the least unemployment. The survey considered the employment situation in 215 countries. As of March 2018, 1.2 percent of Thailand's total 66.2 million population are currently unemployed. He further noted that according to the report of the National Statistical Office, a total of 170,900 newly graduated students are reportedly unemployed. Minister of Labour Pol Gen Adul Saengsingkaew has called a meeting of government agencies and the private sector to find a solution to this problem. The Ministry of Labour will be providing job finding assistance through services at the Smart Job Center, local employment offices, mobile units, and online services on www.doe.go.th/smartjob and the Smart job Center smartphone app. The DOE chief added that the unemployment rate is affected by factors such as higher education being pursued in fields that are not currently in demand in the labour market, or personal decisions to prolong job hunting, while some graduates want to start their own business or take over the business of their family. The DOE will also be reaching out to companies seeking employees with a bachelor's degree and creating a list of vacancies to assist unemployed graduates. It will also be providing guidance sessions for students prior to entering university, providing them with an accurate outlook on the current labour market. 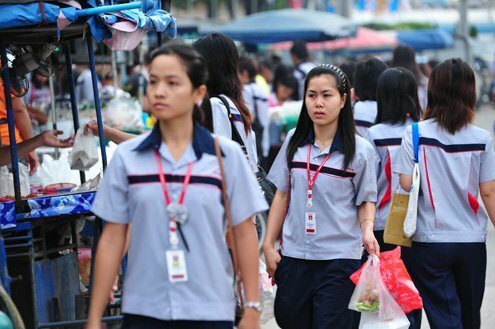 As of March 2018, 1.2 percent of Thailand's total 66.2 million population are currently unemployed. makes no sense; i am not employed, by immigration law i cannot be; are all old people and children employed ? Swinging in hammocks at motorcycle ranks on street corners, and watching rice grow were among the highest ranked occupations? They calculating the percentage from the people who could be employed. So foreigner without work-permit not counting, old people after some age not have to work, children I hope they not counting as children should not work either !!! More or less I guess it's a similar counting as in Europe and don't tell me they are cheating more with the numbers, because every country (even in Europe) they do that. AND the 'government' and their stats simply LIE! Anyone who has ever seen two or three Thais doing one man's job should know why the official unemployment rate is very low here. Whenever anyone comes to my condo to do anything there are always more people than it would take to do the same thing in the West. Usually one to do the job, one to pass things to the one doing the job, and one to tidy up for the other two. For important jobs you may also get the owner or manager turning up, and he would do nothing apart from give orders to the others. Totally true. And look at all those superfluous, worse-than-useless masses of 'sales assistants' in Home Pro and other supermarkets: more staff than customers! Despite all of this, the 'government' will still lie through their teeth about anything and everything concerning Thailand. The genuine figures of genuine unemployment cannot be what the government claims: as other posters have said, we see numerous unemployed Thais all over the place. Where do they get these figures from? Within 100 meters of our home there are 6 unemployed men, if that is the same in every village in Thailand the figures would be considerably larger than the government admits. The workforce comprises only about 29.2 million people, the total population is almost 67 million, expressing unemployment levels as a percentage of the total population is disingenuous at best. Your village must be a hive of activity,and they must be going flat out at about a million miles an hour. The chief occupation for males in my village was watching the females work-the harder the better. Yes mate only 6, but as there are only 7 houses in that 100 meters, 6 is a lot of unemployed men. Another fact all the women in the 7 houses work. Yeah,that would be about right.. So you and I would both agree that life is pure hell for the average Isaan male,then? The 1,2% is easy to understand. Just take when I call True Vision for come fix my router. Suddenly it stands 4-5 people outside the door.